My family emigrated from Germany and Holland, so I have had a lot of European influence in my upbringing, but I was raised in Port Alberni. My grandmothers were both very handy, one worked as a seamstress, and the other raised seven children, making most of their clothing. Growing up I was always frustrated with how difficult it was to find clothing that I liked that also fit. As I got older, I began altering my own clothing to fit and suit me better. In high school, I decided to take sewing lasses as an elective, and I flourished. After high school, I went off and did many other things, including hair dressing, construction, and farming, but I always kept on sewing and dreaming of one day making beautiful and amazing things, and even having work that revolved around this kind of creativity. Then it was time for a big change. Time for me to do what’s best for me; something I’d wanted to do for most of my life. So, I left my hometown, moved to Vancouver, and decidedly went to the Art Institute to pursue and education there. It was the best choice I have ever made. My hometown, Port Alberni, considers itself the Salmon Capital of the world, so the salmon, and its importance to the indigenous people of the west coast, was a big part of our education, and much of the inspiration for my design for the Chic Sheets Challenge. After growing up in India, I moved to Vancouver for school. Since grade school, I have known that art and design were the fields for me. In school I have been drawn to the direction to become a professional fashion designer. I have always been interested in learning about cultures and languages. Being Indian descent has given me a better understanding of the significance of my culture and others. I wanted to create a look that would be feminine, casual and simple because of my personal style, but reflected the mountains and natural landscape of Canada. I was born in April 13, 1992 in Rio de Janeiro, Brazil. When kid I used to draw what was supposed to be croquis on the school desk and on the back of my notebooks. I would never expect that to be a sign of what was waiting for me a few years later. When I faced the decision of what I was going to study in college I took a chance on this silly habit. I felt in love with Jun Nakao’s paper collection, Alexander McQueen’s Savage Beauty and John Galliano when he worked at Dior. Still at college I discover a new passion, creating printings. Did as many workshops and extracurricular courses as I could, and got better and better. After 5 years of college I had to face the fact that I wasn’t ready for the job market, due to the lack of certain skills. With the support of my parents and parents-in-law, my fiancé and I came to study at Vancouver to improve ourselves, and it has been a great experience so far. The Idea of North dress was inspired by the untitled painting of Canadian artist Lawren Harris, founding member of the Group of Seven. The painting was recently part of an exhibition at the Art Gallery of Ontario with the same title. The phrase is borrowed from Canadian pianist, composer, and broadcaster Glenn Gould. According to the Hammer Museum, Harris “…scenes of a cold and empty northland, isolated peaks, and expanses of dark water beyond barren shorelines remain for many Canadians and non-Canadians the essential images of the country. I have always been a fashion enthusiast from a very young age. I was highly influenced by Japanese street wear culture at the early stage. As time went by I was more into high fashion and researching on different European fashion houses. 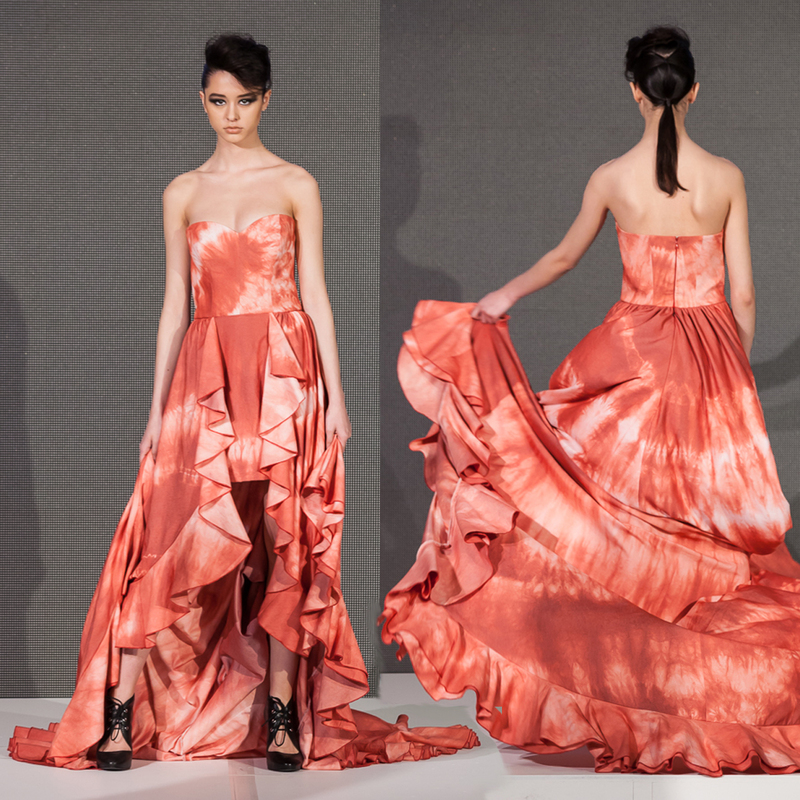 I have developed the love for elegance and femininity of women’s wear and couture. After I have finished the bachelor degree of Finance, I decided to follow my passion and pursue my dream becoming a fashion designer. I was originally inspired by how the midribs of the maple leafs that branch into veins, and the veins continue to branch into small netted veins. It has reminded me of how Canada is made up of people from all over the world, and it’s essential for the citizens to be united, peaceful and tolerant of people from different races, and that’s exactly what Maple leaf represents as a recognized symbol of Canada. I was born in Korea. Having developed an appreciation of fashion design from an early age and entered Kayon School of Art & Design before transferring to Sejong University to complete BA degree in fashion design. After graduation I worked in Korea for 3 years as a fashion designer at Moonya Moonya in GB Style. 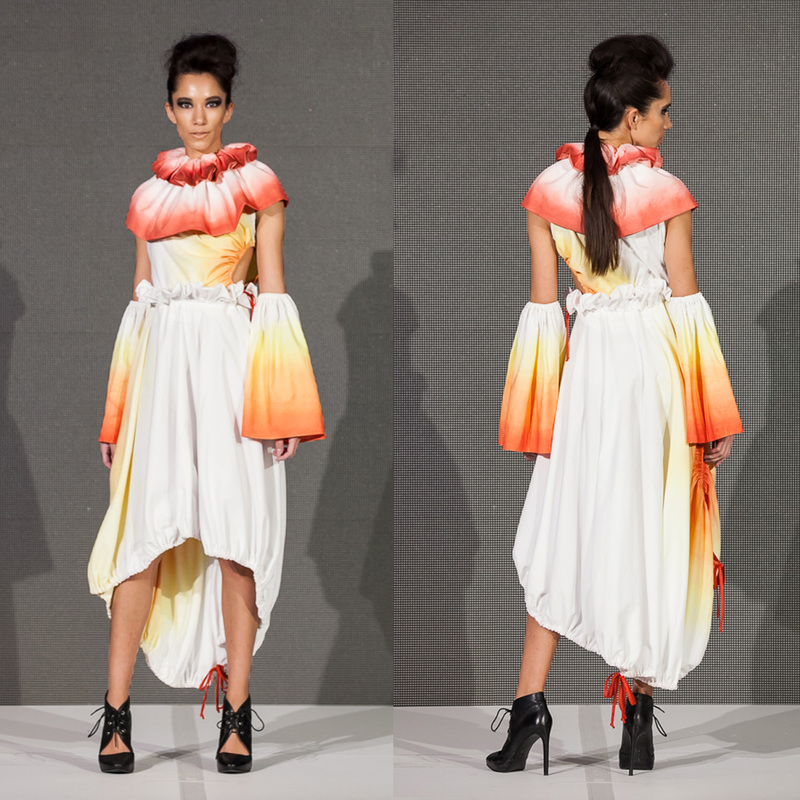 I moved to Canada in 2013 to continue my studies in Fashion design. Using my past experiences in Korea as a foundation, I explored and created with new ideas here in Canada. 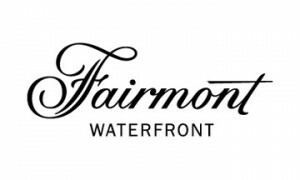 In 2016 I presented my first collection at Vancouver Fashion Week. 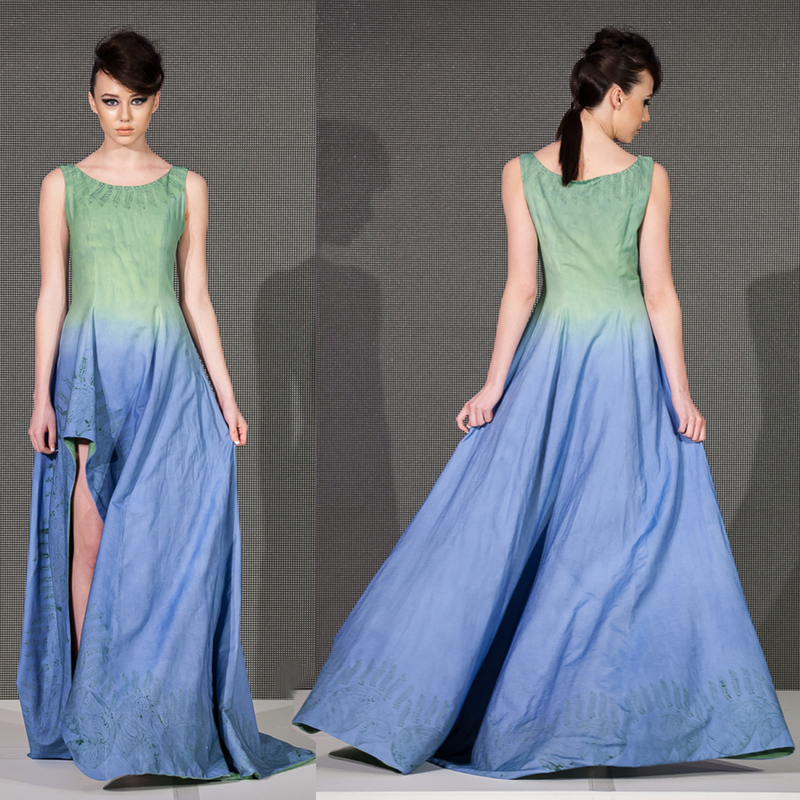 The inspiration for this dress was the northern lights. Only a few countries in the world can see the aurora borealis and I think Canada is privileged to be able to view the northern lights. I want to show the beauty of Canada’s northern lights through my dress, in order to keep the northen lights and Canada’s scenery as beautiful as it is. We need to protect the environment and I would like to convey that message with my dress. My journey in fashion began since I was a child. I found myself really enjoyed laying with dolls, even till now, I still do. I always was asking for fabric scraps from an atelier in my hometown village in Moldova. I can still recall, I would sketch and create new designs and I felt that it was a sign for me to be a fashion designer when I grow up. However, I chose another path in my life and I came back to fashion when I was 30 years old. 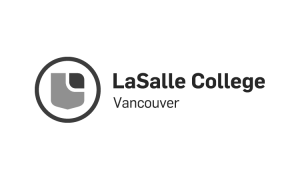 I decided to take the opportunity to come to Vancouver and join LaSalle College. In continuing to go chasing my dream, I sacrificed my family as an individual, a wife and a mother. With my past pushing me forward I am driven to take on any challenges ahead that I might encounter. I am honoured to be involved in the Eco Fashion Week. For me, sustainable fashion is timeless fashion that cares about our environment and our future. For my Chic Sheets inspiration I went back to the history of the First Nations. I was inspired by a book “The Last of the Mohicans.” Mohicans­– was a tribe that lived in lower Canada. They were honest and decent but defenseless. I created a Goddess. Her Name is Uncas. She is the interpretation of the nature, mountains (the silhouette of the dress) and the indigenous (the colours of the dress). She protects the history and reminds us to care about the environment in order to have a future. I am very honored to have this opportunity for chic sheet competition. Fashion design brings me a lot of inspiration, full of enthusiasm in the clothing design, efforts me to innovation design better works. Hope my design can not only visual impact, but also useful , because of Social environment lots of designers designed by follow trends the garment are not last longer, I feel it was not good for the environment and waste money. This also wish everyone to pursue their favorite things And don’t blindly go with the flow. I am so glad to be one of fashion students in Eco fashion week , And with other excellent designers, this is a valuable experience to everyone! Inspired by the diversity of Canada’s population this dress combines elements of Asian culture with details from European fashion history: namely the ruff. The ties that surrounds the circles symbolizes how Canada connects all the different cultures together in harmony this is further reflected with the colours of our flag. I moved to Canada from South Korea 6 years ago to pursue my dream to be a fashion designer. I always knew I wanted to be a fashion designer since I was really young but coming to Canada and having an avenue such as the sewing class in my high school, Chatelech Secondary High School solidified this dream. My design aesthetic is clean structured pieces with particular attention to details. This garment is inspired by how multicultural and diverse Canada is. 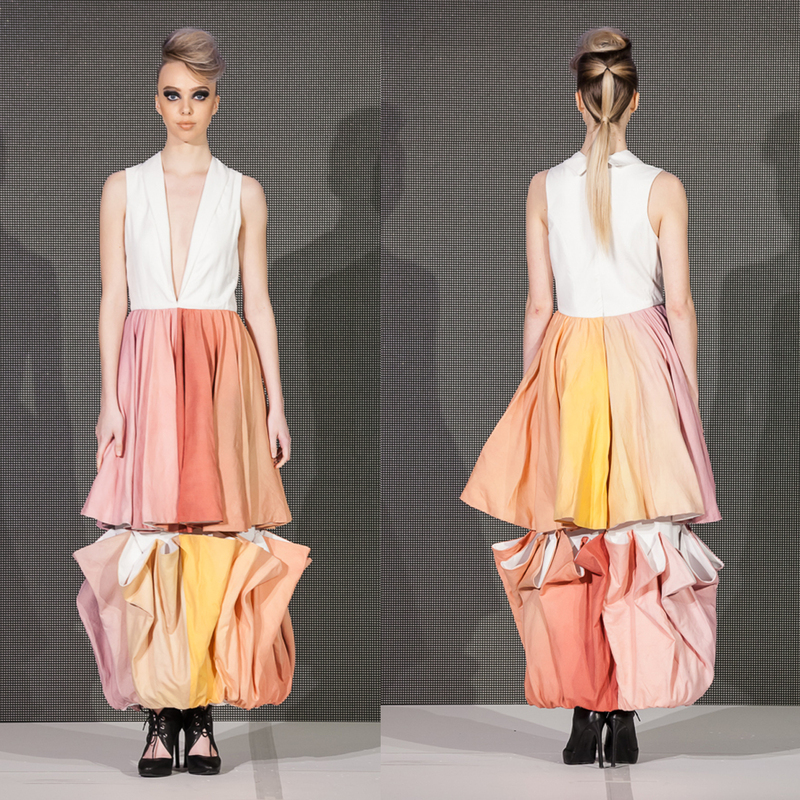 Each pleat with different colours represents the diverse cultures in Canada, and when the model walks, these pleats more uniformly which shows how these different ethnicities are able to live together in harmony.